How do I even begin? This is just so gorgeous, but one must see it in person to appreciate it. 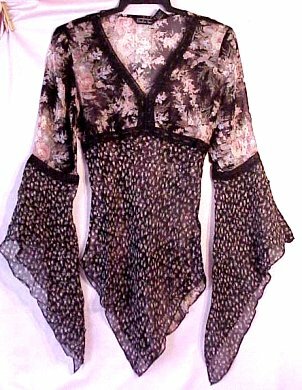 The flowing black floral blouse is gothic influenced with its exaggerated sleeve length, but it is definitely a reflection of a 1960's and 1970's style peasant blouse. The delicate and feminine blouse has a sheer black background with a salmon pink floral and a touch of sage foliage. There's just a splash of light blue so the blouse could be worn with jeans as well as black or dark olive pants. This vintage reproduction blouse is cut for small chested women. It best fits A and B cups and can fit a true C, but the black lace directly under the bodice barely makes it over a true C cup. The flowing blouse is hand washable as it is 100% polyester crepe. It does not have to be dry cleaned. It is helpful with the proper fit if you state your actual numerical size under comments when ordering.